Along with developing an understanding of oscillators and filters, achieving mastery of modulation is key to successful synth-based sound design. Modulation simply means 'change over time', and it always involves a source signal and a target parameter, bound together in a modulation matrix or equivalent system, with an amount control determining how heavily the former affects the latter. Just like a synth’s oscillator, the LFO has several waveforms to choose from - but there’s one big difference: it operates very slowly. Attach an LFO to a sound volume control, and you’ll hear it ‘wobble’ up and down, just as if you were tweaking the parameter yourself. 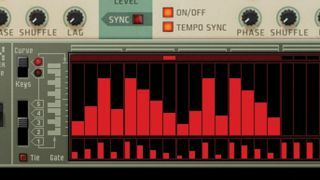 The LFO’s Rate (or speed, or frequency) can usually be locked to your DAW’s tempo or set in Hertz (cycles per second), and the Depth control determines how far it moves the parameter it's assigned to. Interesting LFO shapes include stepped waves, and the ‘random’ sample-and-hold option. Some LFOs can run so fast that they become audible oscillators by introducing sideband harmonics. Common things to hook an LFO up to include filter frequency and resonance, wavetable position, and panning. Once you’ve mastered the basics, try modulating one LFO’s rate with another LFO for interesting speed changes. Some synths have LFO attack or ‘fade-in’ controls, making the effect kick in slowly over time. A common example is delaying vibrato, so that the pitch wobbling creeps in as a note is held. Rather than being ‘always on’, like the LFO, the envelope is triggered every time a note is played. The most common example is a synth’s amplitude envelope, which rises when a key is pressed, then falls when the key is released. A typical envelope has four stages: the Attack stage, where the level rises after the note is pressed; the Decay stage, where the level reduces to a defined point; the Sustain stage, which keeps the level at a value of your choosing until you let go of the key; and the final Release stage, fading the level down again. This kind of envelope is known as an ADSR envelope. A common modulation target for an envelope is filter cutoff, but as with all modulators, any parameter is fair game. In many modern synths and samplers, envelopes can be looped, making them a sort of cross between an envelope and an LFO. Other designs allow you to invert the signal, starting at full level and fading down when a note is struck. Some envelopes have more stages than the traditional ADSR, adding Hold or Delay stages into the design. Popularised by Native Instruments Massive and taken further by cutting-edge instruments like Vengeance-Sound Avenger and Xfer Records Serum, many modern synths allow you to draw your own custom modulation shapes. Add, remove and reposition nodes where you want them, then move and bend the resulting lines and curves to precisely define the shape of your bespoke modulation signal. By telling this type of modulator to loop round and round indefinitely, it takes on the role of an irregularly shaped LFO. Switch it into ‘one-shot’ mode, and the modulation will only happen once when a note is pressed, making it behave more like a traditional envelope. Synonymous with classic drum machines and old-school modular rigs, a sequencer is a grid-based modulator that outputs regimented control data. Draw in output values across the steps, set the sequencer’s Rate (either synced to host tempo or free-running in Hz), then assign it to trigger the parameter(s) of your choosing. One great example of a sequencer is Reason’s Matrix device, which can be hooked up as a CV controller to any parameter in Reason’s rack - including those of third-party VST plugins since Reason 9.5. By programming a sequence of voltages into the Matrix, you can run any effect in a rhythmic way, whether just turning it on and off, or varying the levels of parameters through the sequence. Often confused with step sequencers, arpeggiators traditionally take in the multiple notes of a chord, and divide them up into a regimented monophonic sequence in a direction (up, down, up-and-down, etc) and at a speed defined by the user. However, most modern synths also allow you to hook them up to control other parameters, too. The forward-thinking folks who came up with the MIDI specification had modulation in mind, keeping plenty of messages free for non-note-based operation. Your virtual instrument might listen to MIDI messages like Modulation, Mod Wheel, Expression and Aftertouch commands, and some might even be able to use certain MIDI message inputs of modulators for their parameters - routings like this are often accessed via a mod matrix. The most frequently used MIDI property is Velocity. It’s usually hardwired to note levels and filter cutoff frequencies, but it can often be routed to other parameters, too, depending on the software you’re using. When we set an envelope to control a sound’s amplitude over time, we’re defining the dynamic response of the signal. However, what happens if we take the volume level of a sound and use that to dictate the movement of other parameters? Envelope followers do just that, and the perfect example is the auto-filter (or ‘auto-wah’), which detects the amplitude of the input signal and uses it to modulate the cutoff frequency of a filter. As the input jumps up and down in level, the filter responds by opening and closing. Envelope follower modules usually feature a Gain parameter, which sets the strength of the modulation; Rise and Fall controls, which define the onset and offset of modulation; and some kind of display for visualising the input signal’s waveform in real time as you adjust settings.